DF G, Author at Friends of Freshwater Inc.
FRESHWATER VILLAGE STILL WITHOUT A SUPERMARKET OVER SUMMER. The ongoing saga of a new Supermarket for Freshwater Village continues, with the expansive retail space at 22-26 Albert Street remaining empty for the foreseeable future. Neither the developer, Chris Rose, nor the lessee, Karellas Group, is commenting and rumours abound. In an attempt to get accurate information, Friends of Freshie wrote to the Managing Director of the Karellas Group, Vasili Karellas seeking a date for commencement of trade. As yet, no response. WHO IS THE KARELLAS GROUP? The probable, anchor tenant of the Retail space in the “Freshwater”complex is likely to be the Karellas Group, who are associated with the IGA/Metcash for basic grocery items, but operate under the Supamart brand for other supplies. Their arrival in Freshwater cannot come soon enough although latest mail suggests a March/ April start. Due to the lack of fresh fruit and vegetables for the near future in the Village, Friends of Freshie surveyed the community with a Facebook site Poll to determine interest in a regular fresh fruit and vegetable market at a site near or in the Village. Based on this response we have written to Northern Beaches Council seeking its support for the Market in 2019. We are aware that the highly successful Frenchs Forest Markets will soon be looking for a new site as their current one is about to be demolished. An opportunity arises. PAID PARKING IN FRESHWATER IS A WORRYING DEVELOPMENT. The arrival of a big end of town parking operator, Wilson Parking, into “the Freshwater”complex at 22 Albert Street, is a concerning development. This is so, because no other public or private parking in the Village is subject to a per hour charge or a specified free period of one hour. This sets a worrying precedence given that it is based on the assumption that all those coming to the Village for shopping can conclude it within an hour. Overstaying in this car park will cost $6.00 for the second hour, $11 for the third and $18 for the fourth. It is also a cashless payment system. In no other nearby shopping centre is there such an impost provision. At the time of writing, not one car was parked in the car park even though it has been open for more than two weeks. The Freshwater Village planning requirement makes provision for a specified amount of public parking space. In the case of the Freshwater complex there is provision for 58 car spaces. This underground car park was meant to take cars off the Street and increase the ambience of the Village. If people boycott it, it will have failed. A critical factor in the life of the Village is the linger factor. This is where people can come to the Village to do a range of things including supermarket shopping and other activities including banking, hairdressing, dental services, real estate transactions and of course café and coffee consumption. Together these require more than an hour to conclude, and the parking fee incurred will have an obvious negative impact. It will undoubtedly force avoidance of this car park, and into nearby streets. It could also force other Village privately run car parks into per hour charging. Our community wants to encourage people to come to Freshwater Village, not deter them. The newly established Body Corporate of “the Freshwater”clearly did not give any thoughtful consideration to the negative impacts of this anti-community initiative. Five commercial and residential holdings in Lawrence Street, Freshwater, extending from the arcade through to Dowling Street were put up for sale by the owner, for $30m. These properties are the largest single land holding in the Village and have been owned by the Zakos family for many decades. Expressions of Interest closed on November 14 and the suits+ clipboards were all over the Village at the time. Apparently they are no longer for sale. Soon to open in Freshwater Village are shops catering for a wider culinary taste. The former pharmacy site in the Plaza will open as a creperie and a gelateria. We see the return of Bakers Delight to the place near where it previously existed and the arrival of Teru Sushi (a sushi train restaurant) run by Hiro’s restaurant owner Francis Kim). These are all welcome arrivals. Harbord Literary Institute turned 100. A Centenary Celebration was held on Saturday, December 1, with more than 300 in attendance. Its history was detailed by speakers including Local Studies Librarian, Michelle Richmond, and former local teacher and historian, Keith Amos. Everyone recounted the various uses of the Hall for a wide variety of functions. Mayor Regan also revealed that he had his engagement party there. 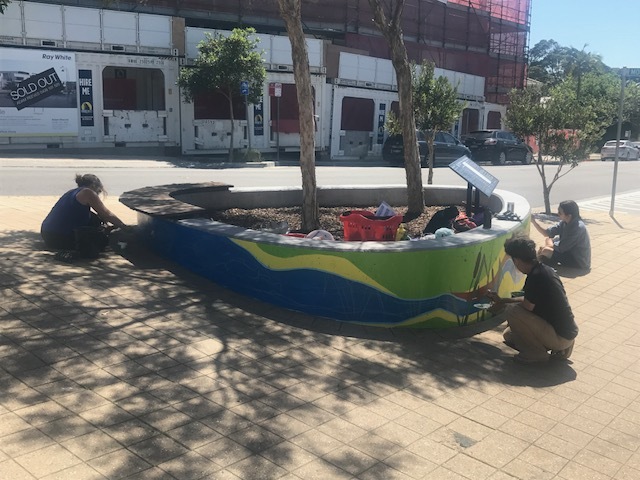 As part of a community development grant gained by Friends of Freshwater Inc. for installation of public art in the Village Plaza, two northern beaches artists, Jaimee Paul and Miguel Gonzalez painted the mural with Freshwater themes across the southern wall in the Plaza. These artists were drawn from a list of community artists compiled by Northern Beaches Council. Another young budding artist, Annika Mulcahy, also has had her work incorporated into the mural complete with her signature. The mural has been well received and is an attempt to give the Plaza more vitality. ARMISTICE DAY CENTENARY PRODUCES A LASTING LEGACY FOR FRESHWATER. 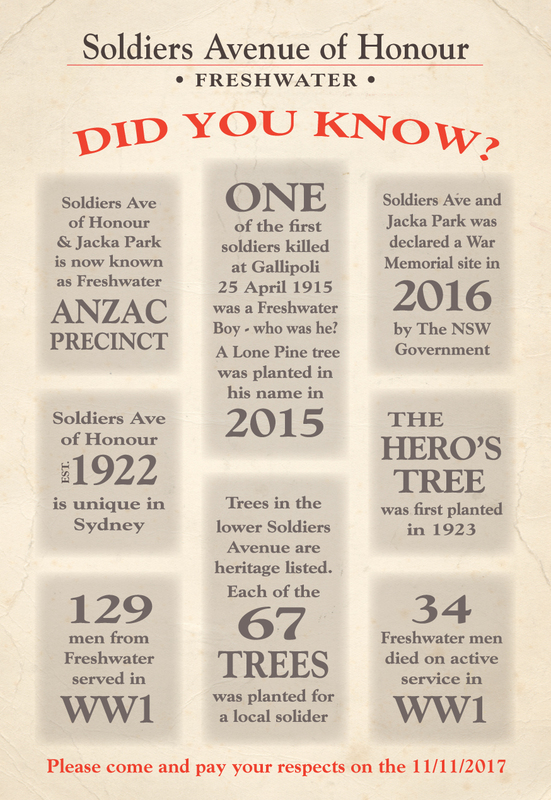 In the wake of the Centenary, Freshwater now has 11 new bronze footpath memorial plaques installed in Soldiers Avenue beside heritage-listed trees, recognising the WW1 service of local soldiers. Two significant bronze sculptures located in Jacka Park representing WW1 returning soldiers and nurses, as well as a commemorative bench to honour the centenary. This bench is permanently placed at the entrance to the Avenue of Honour, near its Albert St. entrance. These legacy items were funded by various State and Federal government grants obtained by the Friends of Freshie on behalf of other stakeholder organisations. OUTSTANDING RESULTS FOR BALLY BOYS. We are indeed spoilt for excellent secondary schools on the northern beaches. The recent 2018 HSC results again confirmed the emerging academic reputation of Balgowlah Boys Campus. It is now the most academically successful public comprehensive boys school, based both on its HSC and its Naplan Literacy and Numeracy results. In HSC English results, in particular, the Campus was 7thin the State, ahead of many Selective Schools including Manly Campus. It rose from 96 to 62 in the State overall. Not surprisingly, parents have also noticed, with 260 boys enrolled for Year 7 in 2019, of which 75 are coming from Harbord Public School alone. Dux of Bally was All Rounder, Joshua Smith, who also won a Freshwater Community Bank Tertiary Scholarship valued at $5,000. Joshua had previously attended Harbord Public School. His Principal, Paul Sheather, is also a proud Freshie person. Land Care have provided a further $12,000 for professional work to be undertaken in Undercliffe Reserve. This will complement the volunteer work being done by Friends of Freshwater. If you would like to join with us on alternative Thursdays, then get in touch with us via this Facebook site or our website as per below. You will be most welcome. JOIN the Friends of Freshwater for 2019. If you are thinking of becoming a member of FOF, or simply renewing your membership for 2019, then hop on line to our website at for easy subscription. 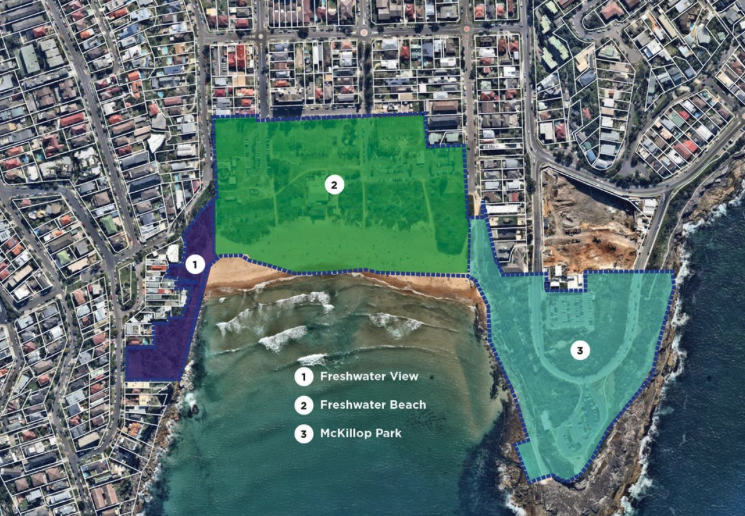 Revitalise the weed-infested southern headland of Freshwater Beach. With volunteer and professional assistance. 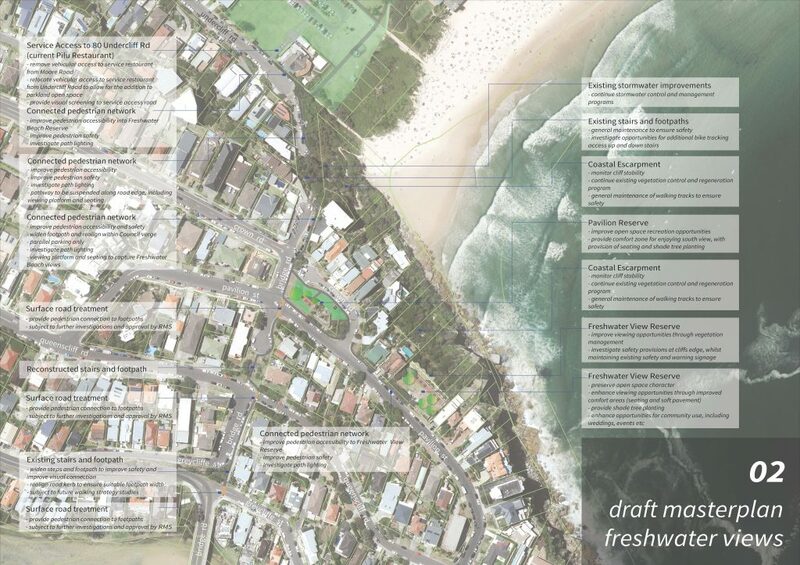 At its last meeting on 22 May, Council approved its Freshwater Coastal Space Master Plan. A summary of the changes made since the draft plan are on our home page for your reading. It should be noted that the Beach Reserves have not received any attention from Council since the 1980’s and there are areas of great neglect. Playgrounds are run down, public toilets outmoded and walking tracks eroded. Many proposals in the Draft Plan, which caused great community concern, have either been removed or modified. A road from Undercliff Rd., to service Pilu restaurant (Gone). The former road will be sealed. Green Space between Ocean View Road and Kooloora Ave. (Gone) although a small strip along the dune edge has been proposed. Council approved the conversion of the overflow car park (formerly an in-filled Freshwater Creek) to be officially a car park. This had some opposition from some locals who wanted to see it retained for occasional recreational use. The Board Walk Missing link has been resolved with its extension from Lumsdaine Drive through to Mckillop Park and thence to the northern end of Freshwater Beach at Ocean View Road. 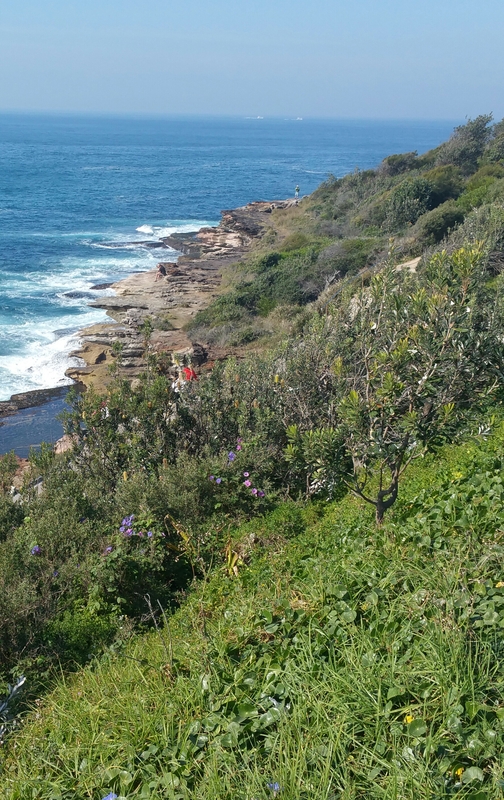 The Walk will be constructed along the rock platform so as to not disturb a healthy stand of native vegetation. This was a great win for bush regenerators. Russell Beardmore, Tanya McAllen and Harry Eliffe who raised their concerns with the draft proposal directly on site with the Mayor and senior management. 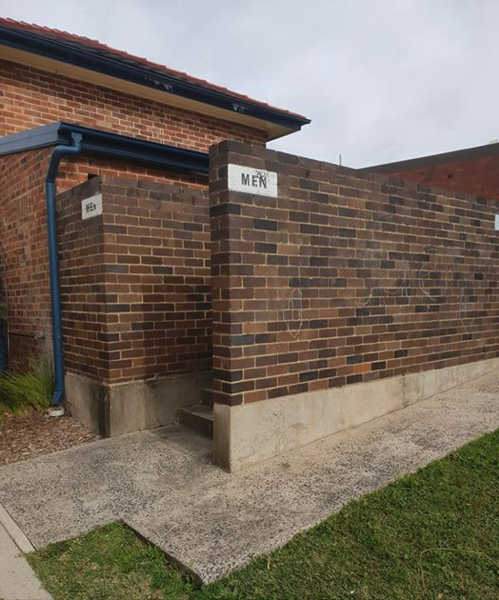 New Public toilets have been proposed for construction on the western end of the Surf Club. Likewise, new playgrounds are proposed to replace the existing two that are antiquated and too close to roads and passing traffic. There will be a pedestrian footway up Bridge Road to the Queenscliff Steps as another part of the Coastal Walk connection. Pavilion, Undercliffe and Freshwater View Reserves are also specified for upgrading. 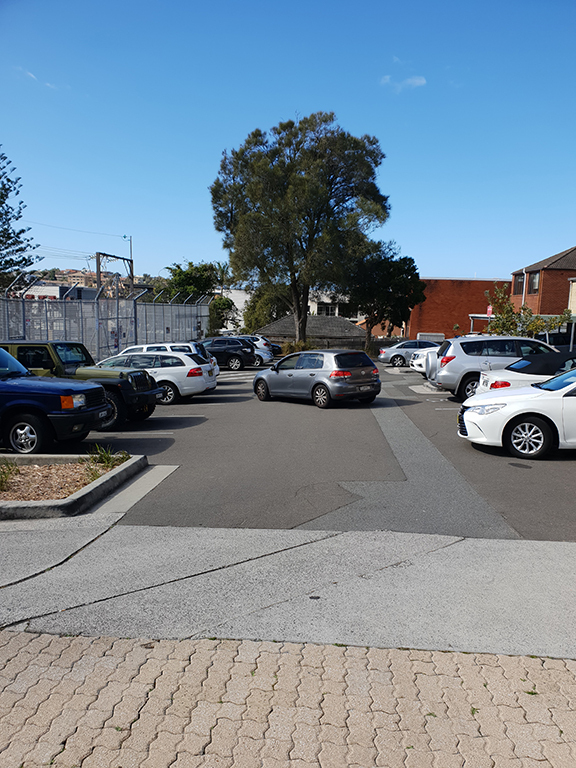 Overall the Reserves precinct will gain an extra 35 car spots from the proposal and maintain green space in largely its current configuration. The Coastal Walk extension looks to be first cab off the rank for construction work. This will be paid directly from the amalgamation funding provided by the State Government. 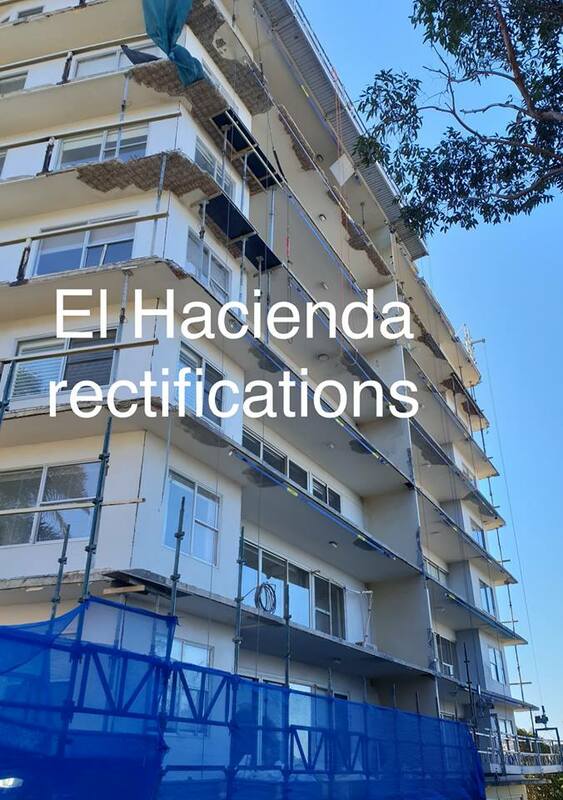 Hindmarsh Constructions has completed its construction of the Apartment and retail building in Albert St., for its Mosman-based developer, FW Projects, but everything has seemingly come to an abrupt halt. The building was set to be completed in June 2017 and is now a year behind schedule. Are there structural defects, which need to be rectified before the building can get its Occupation Certificate from NBC? Is there a contractual legal impasse? No prospective retail tenants are fitting out their premises nor have apartment owners moved in. There is an eerie silence about the building, and the Duke senses that the only apparent activity is that of dollars burning. Spare a thought for those who bought off the plan and are constantly rearranging their lives to cope with the delays. The changes to legislation which now mean that all construction defects have to be rectified before an Occupation Certificate is issued by Council are apparently at the heart of the delay. Of course this has a more than passing interest to other businesses in the Village who are waiting upon an uptake of passing pedestrian traffic. “The Freshwater” has provision for 62 parking spaces for its retail customers. The previous Growers had 35, so this will be a big boost to the Village when the complex opens. One hopes that it is sooner rather than later. Vodaphone is currently installing a 4G Tower atop the Polar Bar two-storey building at 87 Harbord Road. The immediate community has not been consulted, and Vodaphone merely sent a letter to Council on 1/12/17 indicating its intentions, and mentioning that it was placing an advertisement in the Daily Telegraph, with a 10-day turnaround for the community to raise any concerns. This has distinct echoes of the OPTUS Mckillop Park Tower fiasco and the Friends of Freshwater thought that we had overcome the sneaky approach of Telcos to proper community consultation. The protocol developed included proper notification of the community plus the lodgement of a DA so that the normal planning processes would apply. Vodaphone is now hiding behind the Federal Telecommunications Act to justify its actions. Although we thirst for mobile data capacity, this is not the way to achieve it. 4 Towers were meant to be on the roof of tall buildings not small residential buildings with no EMR measurements undertaken. We need to stop this blatant disregard of the community. We think that this is not worth the risk and is indeed poor urban planning. Fortunately, Council’s Environment Health section has recommended refusal. This is on the basis that” the applicant provides details of the long term effects of EMF and how exposure will be addressed”. Both developments have been in the process of Council assessment for months and are problematic. If a panel process is convened, Friends of Freshie will be there to raise its concerns. Freshwater Village Back Precinct includes the Literary Institute, former Baby Health Centre, Guide Hall, Waves Youth Centre (now a temporary Gym). The 5-story Telstra building (which is used as a de-facto telecommunication tower) and the Ausgrid Electricity Sub-Station, as well as two land holdings at the rear of Lawrence Street. There is also the Oliver Street car park, which is zoned for community use. Friends of Freshwater has written to Council seeking place management emphasis on the precinct, given that it is both a prominent landlord as well as the consent authority for the Village. HARBORD LITERARY INSTITUTE CENTENARY JULY 2018. The unique Harbord Literary Institute is in its 100thyear of operation, and it is unclear as to what Council is planning for any proposed celebration of its longevity. With its organising committee disbanded (a casualty of the Council amalgamation) the usual planning has not occurred. NEW DIGGERS SET TO OPEN BUT WHAT IS FUTURE OF WAVES CENTRE? The Mounties Headland Site is nearing part completion with some residential accommodation and a day care facility soon to be occupied. The impressive new Club will officially open its doors on 30 June and there is a gala occasion being held beforehand on 28 June. Work is continuing apace on other areas and the excavation for the swimming pools/gymnasium/ residential tower, is well underway. Soon a massive number of concrete trucks will begin deliveries in order to lay the foundations for the second stage. At the completion of this project, community attention will revert to the other Mounties Group asset in Freshwater, the Waves Youth Facility. This site was established by members of the Freshwater community via the Harbord Diggers Club. It was meant to be a lasting legacy and gift to the youth of our community. With the quiet removal of the site from the core business of Mounties, its Board is apparently free to use or dispose of the asset as it wishes. 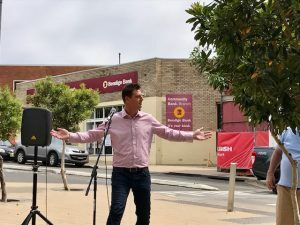 Of course, with a burgeoning youth population, a revitalised youth centre of the kind that was previously operated and staffed by the Harbord Diggers would be well-received by the community. If you are thinking of becoming a member of FOF, or simply renewing your membership, then hop on line to our website at Membership link for easy subscription. This list is constantly being updated. 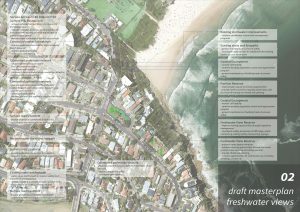 Seeing various aspects of the Freshwater Open Space Master Plan through the planning stage including the upgrading of Beach reserve playgrounds and public amenities: completion of the missing segment of the coastal walkway from South Curl Curl Pool through to Freshwater Beach: bush regeneration of Undercliffe Reserve to bring it back to a natural state, and implementation of a Reserve Management Plan for Freshwater View Estate. The Friends of Freshwater in collaboration with Northern Beaches Council and Land Care is moving to remove a major infestation of the poisonous Phoenix Palms that are dominant in Undercliffe Reserve and spreading to the Southern Dunes. Already a major specimen at the top of Queenscliff Steps has been treated for removal. The spikes of the fronds of this plant are particularly nasty as spiked contact can hospitalise people. Their large canopy also prevents the growth of native plants. 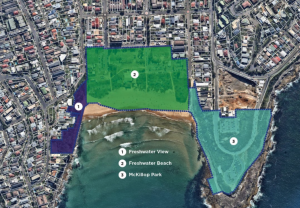 At its meeting on 28 November, Northern Beaches Council approved a recommendation to release its Freshwater Coastal Open Space Master Plan for public comment. 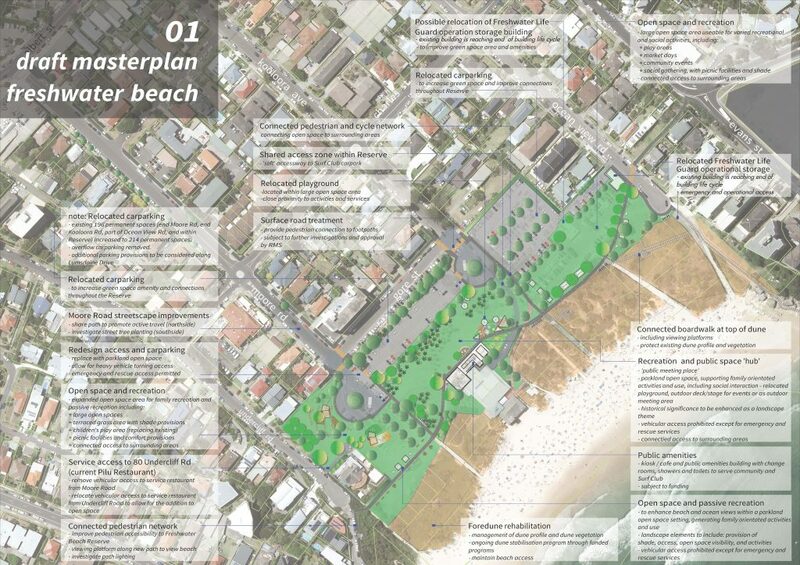 This Draft Plan was prepared by Council staff with input from a project team consisting of reps from Freshwater SLSC, Harbord Diggers, Friends of Freshwater and people drawn from the local community. Funding for its implementation is to be drawn from the Amalgamation funding provided by the State Government. From the perspective of the Friends of Freshwater, this is a once in a generation opportunity to inject some fresh thinking into the workability and amenity of these spaces. 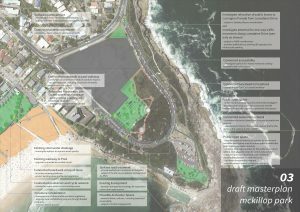 We have been campaigning for a number of years for the missing link of the Coastal Walkway to be completed from South Curl Curl through to Ocean View Road; the two beachside playgrounds to be upgraded; removal of weed infestation in Undercliffe Reserve, and a Management plan for Freshwater View Reserve. The current Diggers development also provides the opportunity to have a fresh look at the configuration of McKillop Park and surrounding streets. 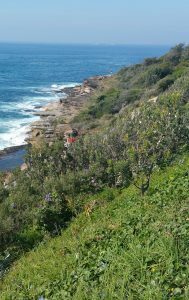 It is without doubt that Freshwater Beach and the surrounding public open space forms some of the most stunning sections of the Palm Beach to Manly Coastal Walkway. The park area immediately behind the beach has been developed in an ad hoc fashion as land was acquired by Councils over a period of time, and is dominated by car parking. This dominance compromises the ability of this important space to function in a way that best serves the community. Additionally, access to the beach area and adjacent headland reserves such as McKillop Park and Freshwater View Reserve, is far from ideal. Maps of the three principal areas under consideration are attached. They extend from Queenscliff to South Curl Curl. Public submissions are being received by Council on its website and at drop-in sessions that are being held adjacent to the Kooloora Avenue playground this Saturday, 9/12, from 8-11am, and on Wednesday 13/12 from 8am to 11am. Council can also be contacted on 1300 434 434. Should you have any concerns about aspects of this plan, we urge you to put your thoughts in writing to Council. An Armistice Day Ceremony to commemorate those men and women who served in WWI, was held in Jacka Park on the eleventh hour of the 11 November, as it has been done for the best part of a century. More than 400 attended including local dignitaries, defence service personnel and descendants of those who gave service. More importantly, Armistice Day is about recognising the fragility of peace and the impact of war on families. This is as poignant now as it was then. The lessons of the 5 years of intense war during 1914-1918 still reverberate almost a century later. 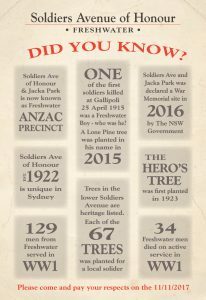 In the Freshwater Anzac Precinct of Jacka Park and later in the Soldiers Avenue of Honour there were some magical moments on this day that illustrate the essence of peace and the depth of emotions for forebears long departed. Pippa Ravenscroft is the 2017 School Captain of Harbord Public School and within a few months, a high school student. She spoke of peace in her own crafted prose at the recent Armistice Day Ceremony. “But in my lifetime, peace is all I have known”. “Future peace lies in our hand and I hope we don’t throw our chances away”. “I hope for a world where everyone lives in peace and harmony”. MARY SUGGATE AT HER SON, BILLY’S TREE. A cameo theatre-in- education role was conducted at the Suggate Tree on the corner of Soldiers Avenue and Marmora St. Local Soldiers Avenue resident, Wendy Machon played the role of William “Billy” Suggate’s mother, Mary, who planted the tree in 1925. Suggate died, aged 19, a century ago, in the battle for Passchendaele, Flanders, Belgium. As “Mary” explained, “Dad and I were never able to visit where our beautiful boy was buried. We shared our grief with dozens of our neighbours. With so many sons and husbands lost, we needed somewhere to grieve. Many towns and villages came up with the idea to plant a special tree for each soldier’s memory. Our good friend, Mr. Holloway, donated the trees in this memorial street from his nursery. This is our Billy’s memorial tree, planted on this corner by Dad and I. 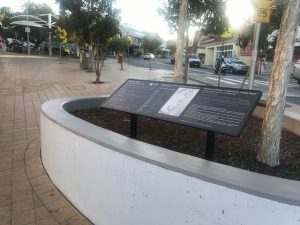 A century later, Harbord Public School, Deputy Principal, Brian O’Rourke unveiled a footpath memorial plaque at Billy’s Corner. The State Government has embarked on the roll out the container deposit scheme across the northern beaches. However, there are very few reverse vending machines to cope with the demand and only 16 shops on the northern beaches allocated as collection points. In Freshwater, only Polar Bar on Harbord Road is so licensed. Soft drinks, juices, flavoured milks and bottled water have all gone up in price, while a carton of beer has increased by $4 a carton due to the introduction of the scheme. An apparent short term windfall for the bottlers. Friends of Freshwater is a strong supporter of the Scheme due to the experience of plastics fouling the beach. 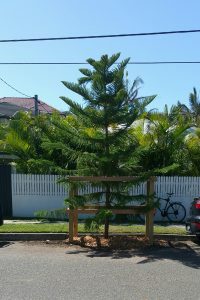 The poisoned Norfolk Island Pine in Kooloora Avenue, on which we reported last month, has been removed by Council. This tree had its roots poisoned by someone wishing to gain an unexplained advantage. It will be replaced by a new pine in this heritage listed stand of trees. We are still seeking further formal feedback on the first of our public art project pods…. the First Peoples Pod. 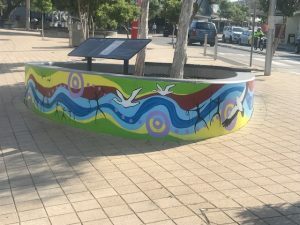 Many people have sought more information about the Aboriginal Artist who painted the pod façade. Leanne Tobin has worked as an artist for three decades. She is of Darug descent and grew up in Western Sydney. In 2011, Leanne won the Parliament of NSW Aboriginal Art Prize for her art work, “Defending Country”. She is currently the Artist in Residence at Blacktown Council’s Art Centre. 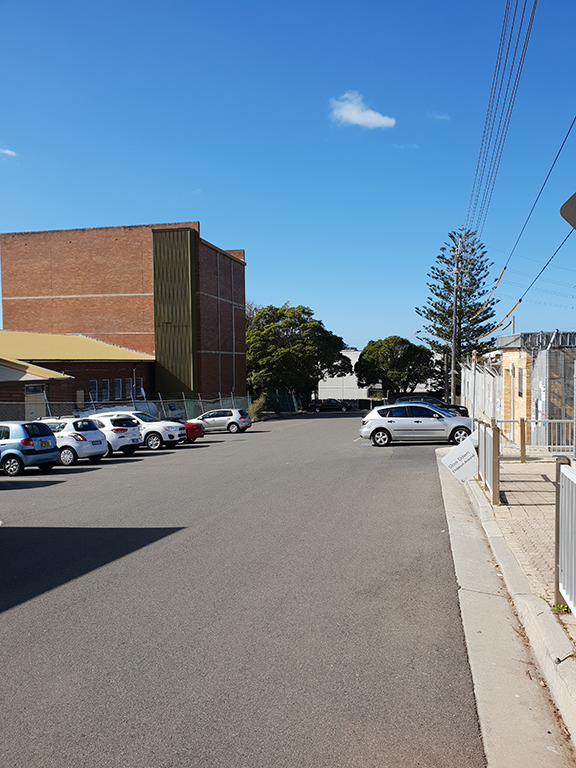 An Alcohol Free Zone will be established for Freshwater Village to included public roads, footpaths and carparks within the area from the corner of Oliver and Lawrence Streets through to the junction of Albert St. and Ocean View Road. Police assert that these are needed public space management tools to combat anti-social behaviour associated with excessive consumption of alcohol. Tim is closely monitoring new motoring technologies such as the introduction of driverless cars and alternative fuel sources. HIGH RENTS KEEP SHOPS EMPTY. One of the downsides of sky-high real estate prices is that the assessed value of property keeps rising, as do rates and taxes. Landlords have to pay these increased costs and often pass them on to tenants in the form of higher rents. In Freshwater, a real estate hotspot, commercial rents are inordinately high. This has led to a number of shops becoming vacant and remaining unfilled for lengthy periods. Something has got to give. A well-attended function was held last weekend, in what was left of the old Diggers Club building. It marked the temporary closure of the Club prior to its re-opening on Lumsdaine Drive in 2018. The last remaining section of the “Old Lady” will shortly be demolished to permit the construction of the final phase of the development. This will include levels of apartments atop a gymnasium and two swimming pools. Some permanent staff have been relocated to jobs at the Manly Bowling Club (which is owned by Mounties Group) and others are being bussed each day out to the Mount Pritchard Club premises of Mounties. It is intended that when the new Club is completed that these highly trained staff will return. Also completed is the major storm water pipe that will remove excess storm water from the site. This will be discharged into the ocean nearby. FRESHWATER VILLAGE IN A STATE OF TRANSITION. The combined impact of major construction projects nearby, changes in retailing and high rents has placed the Village in a period of transition. In a short space of time, the newsagency has closed; a travel agent has moved to other premises in Curl Curl; our two laundry shops have closed and 6 shops on the southern side of Lawrence Street lay empty. Soon our baby health centre will close, and families will have to hop into a car to travel to the Mall for neo-natal and midwifery services. When these services disappear, they never return. On the plus side, we are soon to get a Super IGA supermarket and the return of Bakers Delight and possibly a new tenant for the current IGA space. ARMISTICE DAY 2017 IN JACKA PARK AND SOLDIERS AVENUE. 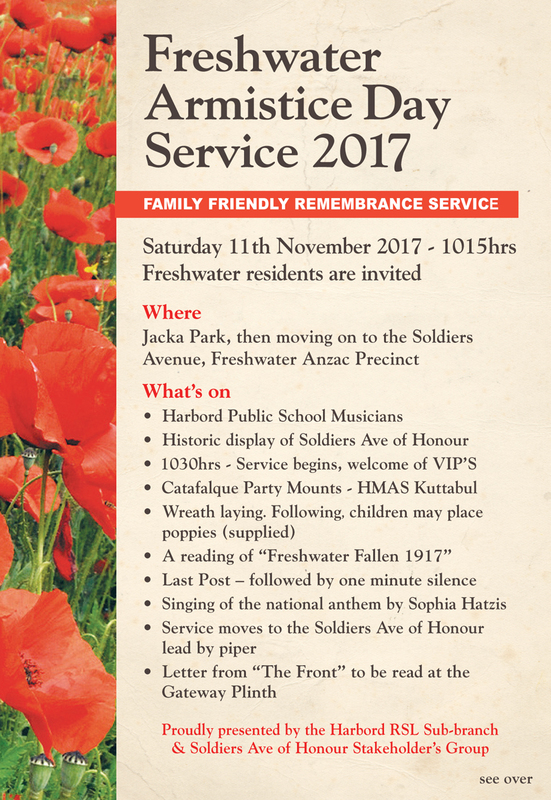 A family friendly remembrance service will be held on 11 November 2017, and a Flyer is attached with details. Each year, our Nation pauses on the 11th hour of the 11th day of November to remember the 60,000 Australians who lost their life in this tragic war. 129 men from Freshwater served in WW1 from a total Freshwater population of less than 1500. 34 were killed in action. This loss reverberates with their families today. 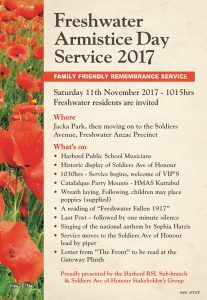 This annual event is organised by the Harbord RSL Sub Branch and the Soldiers Avenue of Honour Stakeholders Group and next year will be the centenary. The 26“Freshwater’apartments on the former Harbord Growers Site are due to be completed by year end. Already major internal fit-outs are proceeding apace and scaffolding systematically removed. At 5 Pavilion St, the 6-storey cliff-top apartment block has now assumed its permanent profile. This should be a welcome improvement on the dog of a building that it replaces. OUR “CELLARBRATIONS” LIQUOR LICENCE CAMPAIGN SUCCESSFUL. Liquor and Gaming NSW has advised that the Liquor Licence application by Cellarbrations has been withdrawn. This was for a packaged alcohol retail outlet in the new “Freshwater” apartment complex (formerly the Growers Market site). With more than 50 submissions from the Freshwater community opposing the application, along with those of the Northern Sydney District of the Department of Health; Northern Beaches Council and the NSW Police, this is a pleasing outcome. 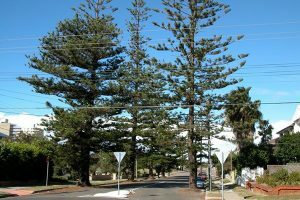 A mature Norfolk Island pine on the beach end of Kooloora Avenue is dying and Council has earmarked it for removal. 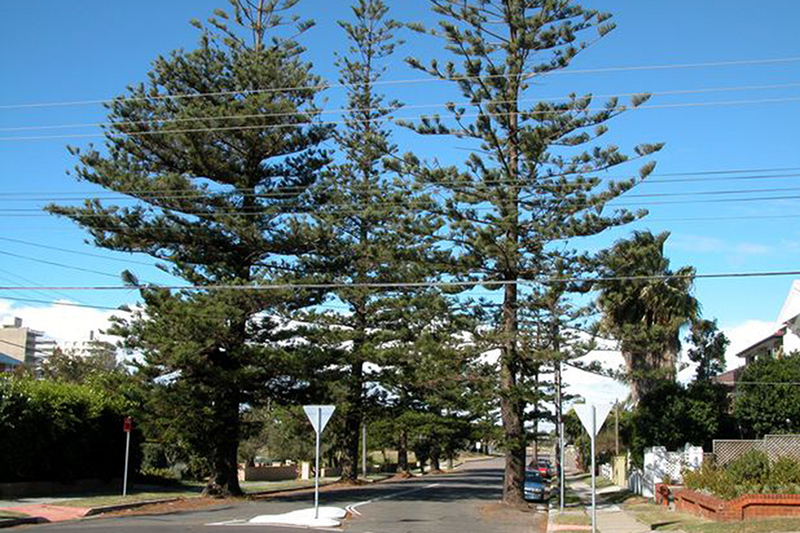 It is part of a stand of mature Norfolk Island Pines in this Avenue that are heritage listed. 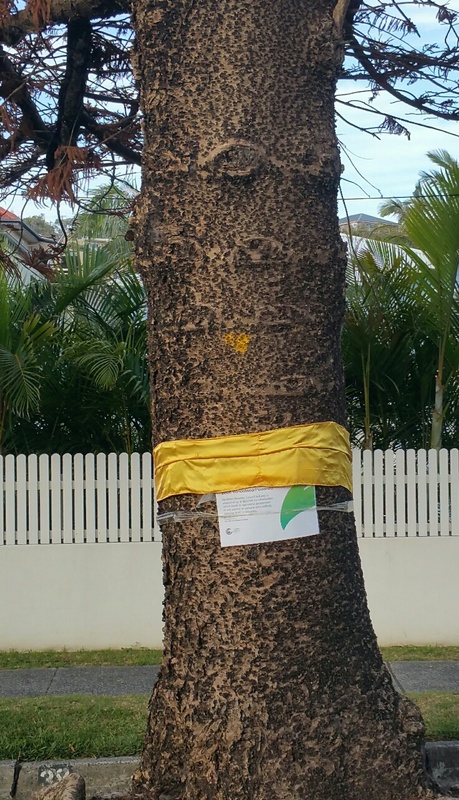 Upon being alerted to the poor state of the tree by a neighbour, we spoke with Northern Beaches Council Tree Preservation Officers. They have been investigating its demise and are of the opinion that it was poisoned by someone. 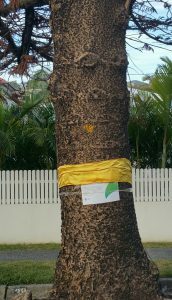 A note to that effect has been placed on the tree and Council is looking for further evidence and offering a $10,000 reward. The Tree will also be replaced. The Friends of Freshwater is frankly disgusted at this turn of events. View enhancing at the expense of trees is the stuff of some beach communities where well-heeled individuals feel that they can do as they please. This has not happened so overtly in Freshwater before and never on a heritage listed tree. SBS is filming segments for a Series on prominent Australian citizens of Italian background. The Series is entitled “Passionate Italians” and will include a segment on Freshwater restaurant owner and chef, Giovanni Pilu. His much-lauded restaurant was recently recognised with a National Award for Best Italian Formal Restaurant. The judging criteria for this Award is based on a ranking by consumers of their dining experience. Clearly there are many contented diners. Giovanni is also known for his campaign to include local produce in restaurant menus and it was fitting that filming of him was partly done in Freshwater Community Garden where gardeners, often from apartments nearby, are growing their own produce. Fortunately, at the time of filming and despite the record dry, the Community Garden was looking like a green oasis. 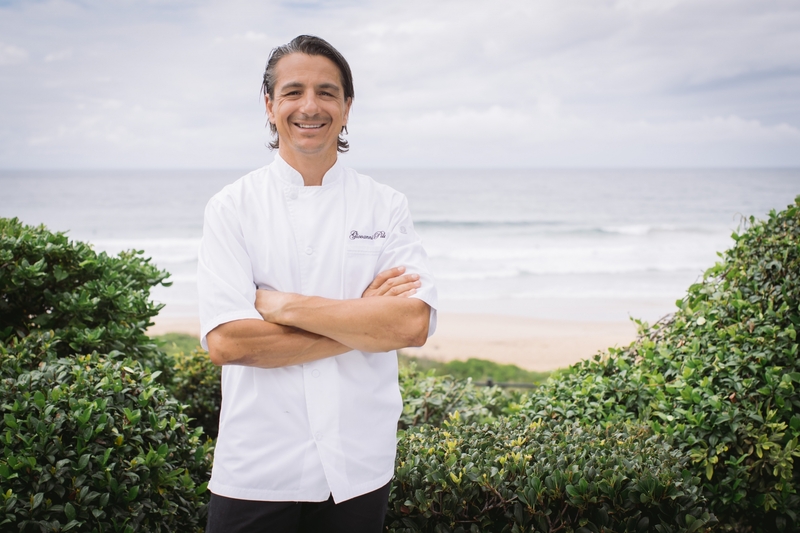 Popular Café Calm Owner and Chef, Cedric La Page, is recovering from an horrendous motor bike accident at South Curl Curl. He was thrown from the bike and had various body injuries including two broken wrists, one of which required micro surgery. For a Chef, one’s hands are tools of trade and the accident has forced him away from the Café, while he recovers. 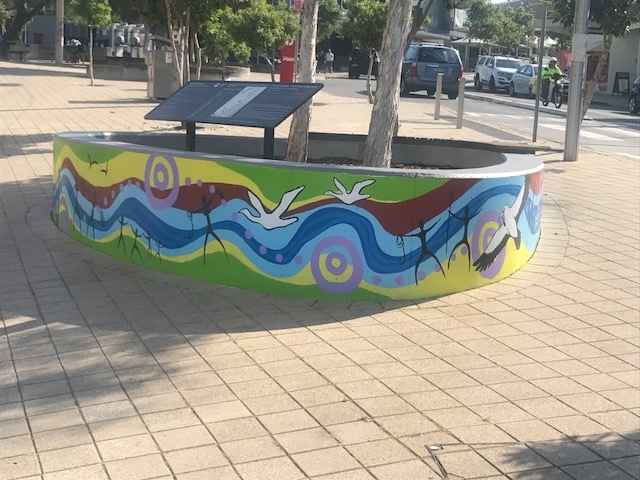 The first of five concrete pods in Freshwater Village Plaza has been the subject of artistic treatment by a well-known aboriginal artist, Leanne Tobin. See photos attached. The other four pods are also to be part of an ongoing public art project. These pods, that currently have a range of functions including as protection for a major storm water pipeline passing underneath, will be used to depict the various phases of the history of Freshwater. This will extend from the millennial occupation by our first peoples; the arrival of our early settlers in the 19th Century; our surfing and Anzac history, and a pod devoted to the future. 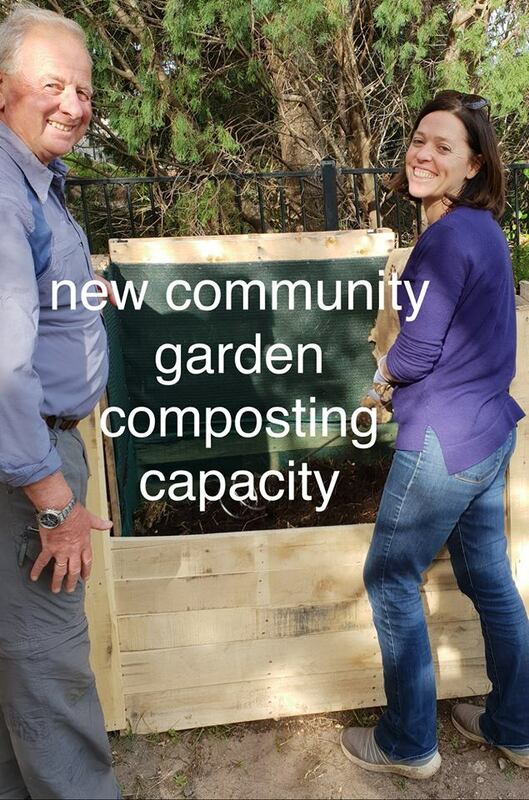 A project team with Sean Rout as Chair, and Stacey Berkman, Kent Bull, Tai Ropiha and Peter Harley as members, has been working for the last two years on this project. On Saturday, September 30, a public launch of the Project coincided with the installation of a painted artwork which depicts Freshwater Creek moving to Saltwater. This is very apt, given that Freshwater Creek snakes its way through our community and down to saltwater at the Beach. There is also a great deal of local evidence, including middens, to suggest that the Cammaraigal clan used both the environs of Freshwater Creek and Beach as regular sources of food, and cave overhangs for shelter. Friends of Freshwater has been successful in gaining a grant from Council to assist with this project, but for its full realisation it will require further crowd-funding. 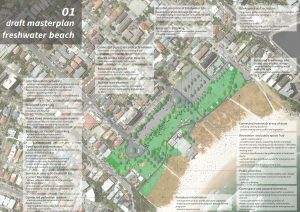 On November 28 the Council submitted a report to recommend that the draft master plan is placed on public exhibition and as available on the Northern Beaches Council Site. The key part is there has been a consultative process since earlier this year that is continuing. Here are the Key parts and the next important step is to attend the following on site meetings on : Saturday December 9 8am-11am – Beach end Kooloora Ave and again Wednesday December 13 8am – 11am – Beach end of Kooloora Ave to learn, discuss it or offer alternative ideas or objections. Drop in and visit Council’s project team between 9 am and 12 noon on 22 March 2017. We’ll have a Council marquee located on the grass near the picnic tables adjacent to Koolora Avenue. Staff will be collecting information that can be used to plan the future of the space. A walking site tour will take place from 10am – departing from the marquee area. Please wear walking shoes, a hat and bring some water along. Drop in and visit Council’s project team between 3 pm and 5pm on 25 March 2017. We’ll have a Council marquee located on the grass near the picnic tables adjacent to Koolora Avenue. Staff will be collecting information that can be used to plan the future of the space. A walking site tour will take place from 4pm – departing from the marquee area. Please wear walking shoes, a hat and bring some water along. The Working Group met to review the draft master plan before it went to Council. HARBORD Diggers has confirmed it will temporarily close on November 1, resulting in 60 job losses. About 40 permanent and 20 casual roles will go when the club shuts to complete construction on its hospitality precinct. General manager Dale Hunt said staff had been notified. “We are exploring a number of options to accommodate permanent and perma­nent-part-time staff during closure and casual staff where possible,” he said. 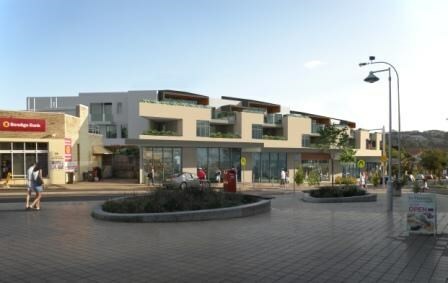 Artist impression of the interior at Harbord Diggers’ hospitality precinct. He said the upgraded club would be one of the peninsula’s biggest employees. “Once open, the new Diggers will provide more than 150 local jobs, ensuring we can continue as one of the largest employers in the area,” Mr Hunt said. Wet weather over the summer had slowed construction, Mr Hunt said. “We lost 60 construction days, which set back the project timeline for stage one,” he said. The closure will allow stage-two demolition and excavation work on the $160 million redevelopment to start early. Temporary Italian dining venue Gio will go when the club closes in November for the rebuild. “While not in our original redevelopment plans, this decision will allow us to reduce the overall construction of the Diggers by approximately eight months,” Mr Hunt said. Harbord Diggers’ temporary fitness venue, Gfitness Freshwater, will be unaffected and members can use sister venue Manly Bowling Club. Precinct Retail has put out a call for suitable hospitality operators at the club. The redesign could include up to four restaurants, Precinct Retail director Matthew Yovich said. “We are looking between two to four operators, with a focus on quality,” he said. Diggers general manager Dale Hunt (pictured) said the new club would be one of the largest local employers. The precinct concept would bring complementary businesses together in a similar way to a shopping centre, Mr Yovich said. Expressions of interest from hospitality operators closed on June 29. The hospitality precinct is scheduled to open by next May. The redevelopment of the club got the green light in 2014. 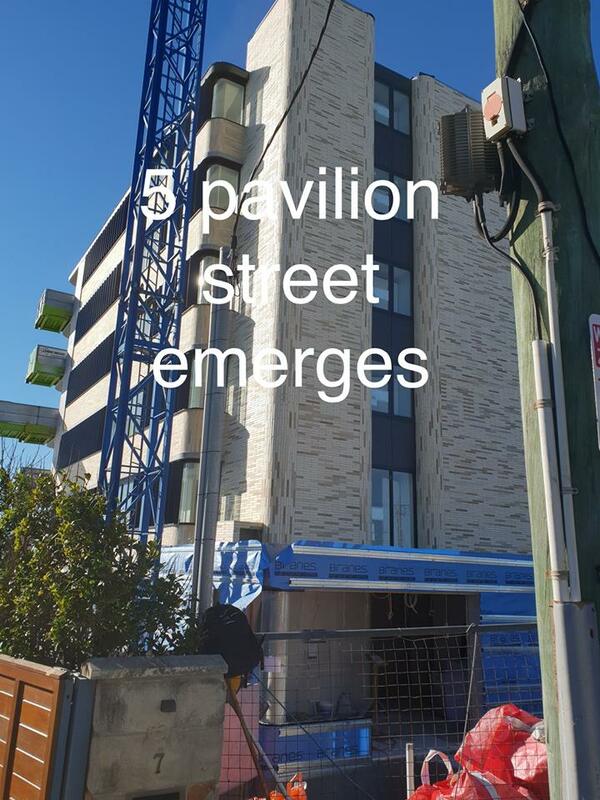 Stage one, which includes the contemporary new club, child care, the hospitality precinct and residences for seniors, is scheduled to open in April or May next year. Stage two will include a fitness centre and an aquatic centre. OUR“CELLARBRATIONS” LIQUOR LICENCE CAMPAIGN SUCCESSFUL. HARBORD GROWERS and BAKERS Delight moving out! With the closing by the end of this month June 2015 the site once held by the Harbord Growers Market and Bakers Delight will become the start of another construction zone. This is the vision of what may become a more upmarket shopping precinct in years to come – for more comments see our Facebook page.